A Streeterville man stripped naked and dove headfirst through the door of a Lakeview comedy club last weekend, then battered two cops who tried to help him, prosecutors say. 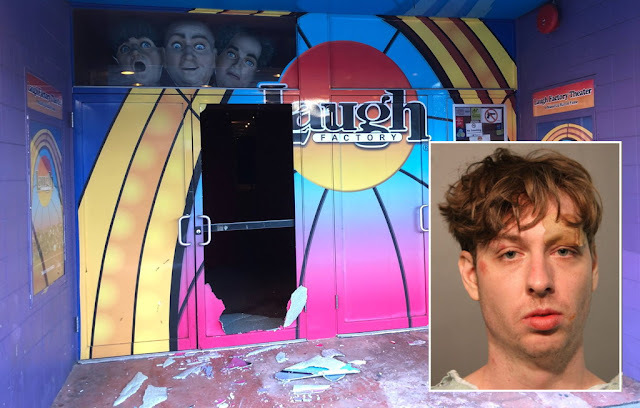 Cops said they were flagged down in the 3100 block of North Broadway around 5:15 a.m. on Sunday by witnesses who “related that a male subject took off all his clothes and jumped headfirst through a glass door into…the Laugh Factory.” Inside the nightclub, cops found 31-year-old Robert Malato on the second floor “naked and bleeding from cuts on his head, back, glutes, and legs….talking about his Freemason father,” according to court records. Police said they tried to walk Malato out, but he allegedly took off his shoes, threw them, raised his fists, and struck two officers in their chests before the cops could gain control of him. Malato was treated at Illinois Masonic Medical Center for multiple lacerations. He is charged with two felony counts of aggravated battery to a police officer and misdemeanor criminal damage to property. Judge David Navarro ordered him held on a $10,000 deposit bond, meaning that Malato will be released if he posts $1,000. Hyperlocal coverage of Lakeview, made possible by our subscribers. Join them now for just $49 a year or $5 a month. Members receive a year’s worth of exclusive reports and services.